I’m loving all the opportunities for creative expression that I’m discovering in Joplin. 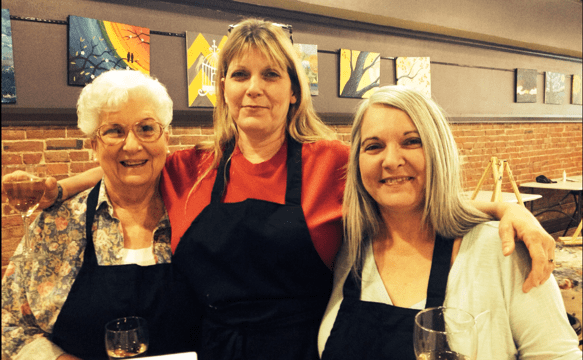 Tonight, my mom, sister Linda and I painted together at RSVPaint, located at 420 S. Main Street. Linda and I visited this place during Third Thursday last month and signed up for a class. Mom decided to join us and I’m so glad she did. 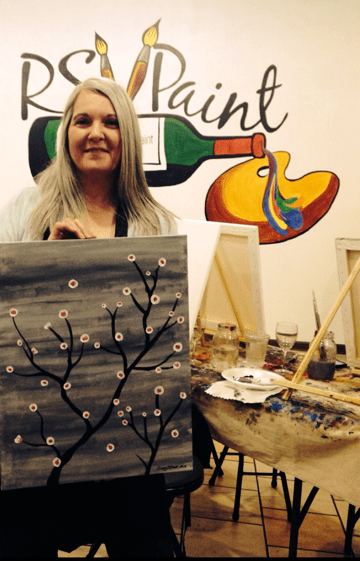 RSVPaint started in Springfield, MO, and offers a place for budding or experienced artists to relax, sip, visit and paint. In two hours, one can create a work of art to take home. A glass of wine is offered beforehand, to remove all fear and inhibitions! Encouraged by their success in Springfield, RSVPaint branched out to Joplin and has been open here for a month. Classes are offered on Thursday, Friday and Saturday evenings. A nominal fee covers the class, all supplies and materials, and a glass of wine. We had such a relaxing and enjoyable evening. Our instructor, Coleman, was fun, engaging and a great teacher. He painted with us, staying a step ahead of us so we could follow along. Tonight’s painting was “Cherry Blossoms”. Six of us sat in front of our easels with blank canvases ready for our artistic touch. I have to admit, the glass of wine did do a great job of relaxing everyone! Conversation flowed easily among us and laughter rang out often. There is something about a fresh, blank canvas that invites creativity and gets ideas flowing. That sense of flow and energy is transmitted to the brush as soon as I pick it up. Coleman made painting easy. He was patient and offered help when we needed it. I liked that we had a sample painting to look at, and could watch him as he created the painting with us. He also encouraged us to express ourselves and use different colors for the background if we wanted. Half of us did so. Although we all admired each other’s work, no one compared one piece of art to another. This was a very supportive environment to express ourselves in. At the end of two hours, we all had a completed painting to take home and a great shared experience. We had so much fun chatting and creating and getting to know Coleman and each other. There are upcoming classes that will provide opportunities for more fun and more creative expression. We intend to participate again and allow our inner artists out more often!